Mohammad Mossadegh may have had no illusions about the dark side of black gold when he nationalised Iran’s oil industry in 1951. Iran had been the first Middle Eastern state to permit hydrocarbon extraction, and the Anglo-Persian Oil Company, later known as British Petroleum, had enjoyed the sole concession there since 1913. Within two years , Mossadegh had been overthrown in a coup organised by the CIA at the request of Britain’s MI6. He was kept under house arrest until his death in 1967. Justin Keating, the late Labour Party politician, would have been well familiar with Mossadegh’s fate when, as a minister for energy during a Fine Gael-Labour coalition in 1975, he introduced sweeping new terms for the oil and gas industry. These gave the Irish State a 50 per cent “take” from any commercially viable finds. At the time, Ireland was no Iran or Saudi Arabia, with no hard evidence of hydrocarbon wealth. For his pains, Keating lost his seat. As he told film-maker Richie O’Donnell, director of The Pipe and Atlantic, in 2008, there was “no explosion of anger in Ireland” when his policy was progressively dismantled. Yet he predicted Ireland would “desperately want . . . a source of income” in later years. If the offshore resource which Keating believed to be there was wasted, it would, he said, be a “crime against the Irish people”. It took activists within an isolated parish in north Mayo, questioning the location of the Corrib gas project in their midsts, to highlight Keating’s foresight – by which time Kinsale gas field, the State’s first commercial producer of hydrocarbons, had been a quiet success. Unlike Corrib, Kinsale gas was processed offshore. 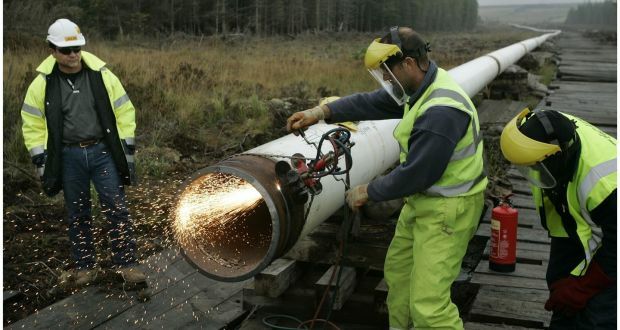 The State’s handling of Corrib, involving a high-pressure gas pipeline linked to an inshore refinery on a bog, shone a harsh light on a sector which has traditionally preferred to work in the shade. Amanda Slevin, a lecturer in sociology at University College Dublin, took the Corrib controversy as a template for her PhD on the dynamics of energy policy in Ireland. Her research also focused on Norway, and how a state with a similar population to Ireland could take a very different path. Slevin ironically notes how Norway was once regarded as “one of the world’s least interesting territories” by geological experts. Several exploration companies were about to withdraw from the North Sea when Phillips drilled one last well in 1969. That yielded Ekofisk, which is still in production nearly 50 years later. She records how a North American lawyer acting for oil companies believed Ireland might be a potential hydrocarbon province as far back as 1957. And yet, as an oil company head told Slevin, Irish politicians “didn’t have a clue”. When Fianna Fáil’s minister for industry and commerce, Seán Lemass, signed the State’s first exploration agreement in January 1959, the Irish subsidiary of US company Messman-Rinehart was given sole and exclusive rights to both onshore and offshore – for the sum of £500. One politician who, like Keating, was somewhat better informed than most was former Labour Party leader and energy minister Pat Rabbitte, who was involved in the Resources Protection Campaign. Yet Slevin notes that Rabbitte was one of a succession of energy ministers who adopted a consistently conservative stance in office. Rabbitte, for example, accepted the industry argument that because there was no big queue for exploration licenses, there was “nothing to see”. Even Green Party minister Eamon Ryan, who had protested against the jailing of the Rossport Five over their opposition to the Corrib pipeline in 2005, made only “minor modifications” to licensing terms in 2007. One former Fianna Fáil minister told Slevin that ministers “associated with the trade unions” were among those who seemed to be “captured” by civil servants in the energy department’s petroleum affairs division. She interviewed politicians, civil servants and stakeholders for her extensive and impressive research, and was told that the officials were “very dedicated people” trying to play with a “very bad hand of cards” . One former civil servant who became an oil industry employee noted that some of his former colleagues were, “incredible as it may seem . . . motivated by the public good”.Favouring private industry over wider society was based on the premise that foreign investment could only be beneficial. The Corrib conflict turned that on its head. One former minister interviewed did not rule out improper behaviour when then taoiseach Bertie Ahern met senior Shell executives after An Bord Pleanála turned down the first plan for the Corrib gas refinery. That particular minister is one of a number of interviewees who are given pseudonyms, due to a data collection agreement on confidentiality, which can prove distracting at times. However, it also allows for a frank insight into how the State works, with political lobbying by oil companies the accepted norm. Slevin records the lengths to which the State moved to protect the private capital investment of Shell and partners Statoil, Marathon and latterly, Vermilion. At one point, a force of 300 gardaí, 160 security staff, two Naval Service patrol ships and a Garda helicopter were deployed to protect Shell’s interests in a parish of around 2,000 people. She traces the tactics of coercion employed, and how at one point she witnessed “individual gardaí crying or looking visibly upset when ordered to move protestors” . The author notes that there has been no detailed independent investigation into issues of political intervention with Corrib. However, the 2010 report for Frontline Defenders by barrister Brian Barrington examined human rights abuses. As well, separate reports by Sr Majella McCarron’s NGO, Table, raised many serious questions about political policing and the criminalisation of a rural community . Slevin places Ireland in an international context, with the country’s tax rate yielding the second lowest rate of return to the State among 74 countries. A separate production tax introduced in 2007 on more recent licenses could see the State take rise to 40-55 per cent. However, as this only applies after costs have been offset, she calculates the likely rate of return will be much lower. The author concludes with a series of recommendations that are required reading for all Oireachtas members. Her first recommendation is a moratorium on all new authorisations until a more equitable model of state hydrocarbon management, drawn up with Norwegian advice, is devised.